Aspergillosis, the leading fungal cause of mortality in immunocompromised patients, presents a serious worldwide challenge—particularly in the face of increasing antifungal resistance. Bringing together the world’s leaders in the Aspergillus and aspergillosis fields to promote cross-disciplinary collaboration among clinicians, industry, and scientific experts, the “Advances Against Aspergillosis” conference was held January 26–28, 2012 in Istanbul, Turkey. 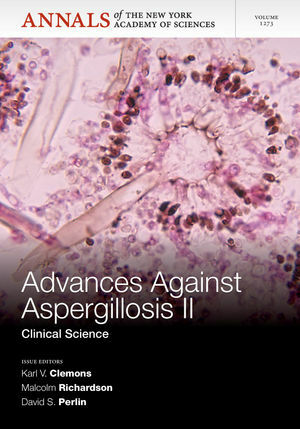 This second of two Annals volumes contains short reviews encapsulating recent findings in the basic science of aspergillosis. Among the topics included are the evolution of modular conidiophore development in the aspergilli; diverse applications of RNA-seq for functional genomics studies in Aspergillus fumigatus; protein targets for broad-spectrum mycosis vaccines: quantitative proteomic analysis of Aspergillus and Coccidioides; activation of the neutrophil NADPH oxidase by A. fumigatus; and cell biology of the innate immune response to A. fumigatus. NOTE: Annals volumes are available for sale as individual books or as a journal. For information on institutional journal subscriptions, please visit: http://ordering.onlinelibrary.wiley.com/subs.asp?ref=1749-6632&doi=10.111/(ISSN)1749-6632. ACADEMY MEMBERS: Please contact the New York Academy of Sciences directly to place your order (www.nyas.org). Members of the New York Academy of Science receive full-text access to Annals online and discounts on print volumes. Please visit http://www.nyas.org/MemberCenter/Join.aspx for more information on becoming a member. Karl V Clemons, Stanford University, Stanford, California. Malcolm Richardson, University of Manchester, Manchester, United Kingdom. David S Perlin, UMDNJ-New Jersey Medical School, Newark, New Jersey.